Retro is in vogue, and Wayne and Gerardine Hemingway have taken it to a new level with their hugely successful Vintage Festival in England. The couple’s brainchild event celebrated fashion, culture, film, and music of the 1920s to the 1980s at London’s Southbank Centre last summer. 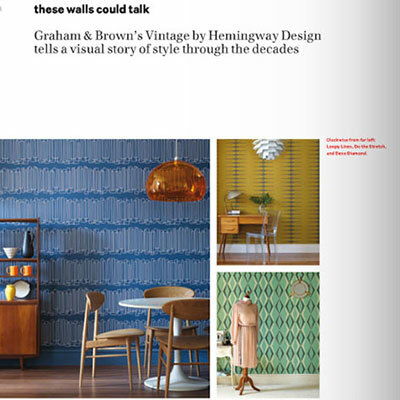 From there, “it was a logical progression to take our strong print and visual sensibilities into wallpaper,” says Wayne Hemingway, cofounder of Hemingway Design based in the greater London area. Thus, Vintage by Hemingway Design wallpaper was born. Produced by Graham & Brown, the collection reflects the style of four distinct eras. Deco Diamond references glamour and the emerald onyx ornaments popular in the 1930s with a diamond facet pattern. Midcentury modern is captured in Grid, where lines playing on geometry and a palette of yellow, red, and gray evoke a 1950s feel. Loopy Lines represents the swinging 69s with its free-flowing overlapping lines that form a modernist composition. And Do the Stretch uses earthy tones and a graphic pattern to convey the groove, glam rock, and science fiction mania of the 1970s. All the wallpapers measure 20 ½ inches wide by 32 ¾ feet long and are sponge-cleanable.